Prominent & Leading Manufacturer from New Delhi, we offer crosscut saws. Available in different thicknesses and lengths, the Cross Cut Saw Blade Manufactured and Exported by us are well valued all around the world. Manufactured from hardened and tempered High Carbon Steel strip. Used manually by applying Straight Vertical Handles on the sides of the blade (Kunda can be provided for the Handle Attachment). Available in Bright Finish only. 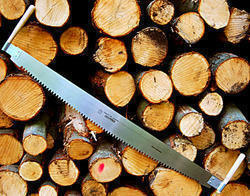 · Working : For cutting small Logs. · Thickness : 14 Gauge and 16 Gauge.